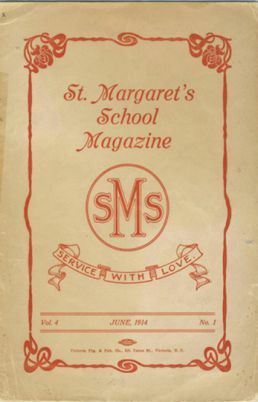 St. Margaret’s School was founded in 1908 by two English sisters, Edith and Isabel Fenwick, who were soon joined by their friend Margaret Barton. The School started in a small house at 810 Cook Street. With increasing enrolment it moved across the street to a larger house at 813 Cook Street and soon acquired the neighbouring house at 819 Cook Street for additional classroom space. By the spring of 1911, plans were underway for a new school and boarding house to accommodate the School’s growing population. Tragedy struck on April 10, 1911 when the Fenwick sisters were drowned in the capsizing of the SS Iroquois as it left Sidney en route to Salt Spring Island. Margaret Barton, who was accompanying them, was found unconscious with one hand bound to the gunwale of a capsized lifeboat. Students, years later, would recall Margaret Barton’s scarred hands from steam pipe burns. Miss Barton took on the role of principal and continued with the construction of a new school at Fort and Fern Streets to accommodate the eighty pupils, including 10 boarders, and five live-in teachers. The buildings were designed by Mr. Francis Rattenbury, a noted local architect, who also designed the Parliament Buildings and the Empress Hotel. The move to the new school occurred over Easter weekend 1912, one year after the Iroquois disaster. 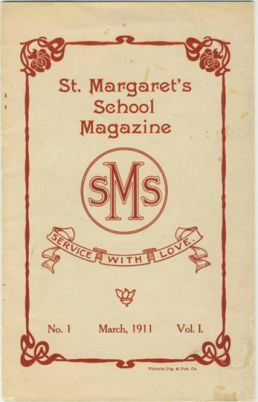 Many changes and developments took place over the years and in 1928 SMS amalgamated with St. George’s School for Girls. By 1969, with aging buildings and the prospect of substantial repair, the present Lake Hill area property was purchased. The Fort Street campus was sold and the buildings were demolished. In September 1970, the new school opened at 1080 Lucas Avenue. 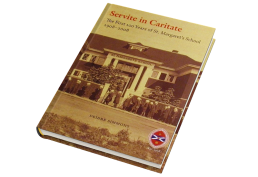 St. Margaret’s School celebrated its centennial in 2008 with the publication of the school history, Servite in Caritate: The First 100 Years of St. Margaret’s School, 1908-2008 by Deidre Simmons. 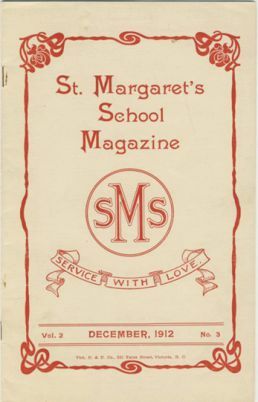 St. Margaret’s School Archives acquires and preserves records and artifacts relating to the history of the School. The holdings include records of the School and its founders, staff and student memorabilia, scrapbooks, photographs, newspaper clippings, uniform items, trophies, and a complete set of the school yearbook, the Cardinal (1911-present). 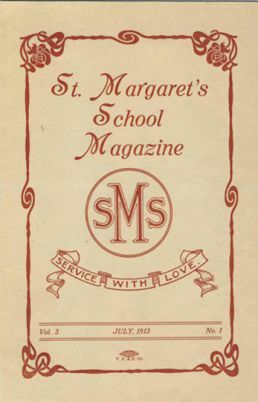 We are in the process of digitizing archival publications, including the St. Margaret’s School Magazine, a student publication from the school’s early years, also the precursor to today’s community publications like Spirit and the Tartan Times. See below for one example: the very first edition from 1911. SMS Archives is open by appointment throughout the school year (September to June). 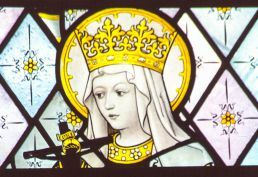 St. Margaret’s School is named after Saint Margaret of Scotland, a patron of learning. As Queen of Scotland, Margaret devoted her life to her religion and helping others. She founded abbeys, worked at reforming the church in Scotland, and used her position to work for justice and to improve conditions for the poor. She was canonized in 1250 by Pope Innocent IV, not only for her good deeds, but for the spirit of loving service she exhibited in all her endeavours.